First off, I have to give you a few warnings. A. I'm terrible at taking photos while DIY-ing. I'm definitely no John and Sherry Petersik. B. The lighting was no good because the weather was cool and cloudy. I know, that's no excuse coming from a girl who calls the NW home. But, it doesn't. And C. The kitchen was literally a mess during this project. Like, literally. So judge all you want. That's okay. Because I can't hear you. Anyway, here's what my mom and I tackled. Yes. You saw it. Funky-monkey 90's wallpaper. And yes, there's more of it around the house. As a total side note, are my sister and I the only ones who think the 90's were ten years ago? And what exactly do you call the 2000's? The double zeros? 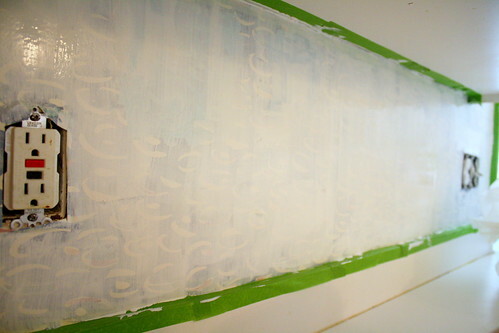 Anyway, instead of removing the wallpaper, we decided to use some wallpaper primer from Miller Paint. That's right. Instead of trying to scrape it off, all we had to do was paint right over it. Like so. 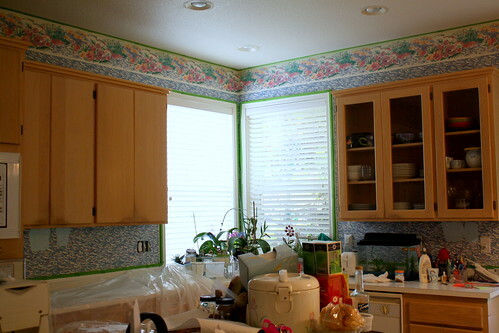 Then, we let it dry while eating lunch (making the kitchen even crazier). 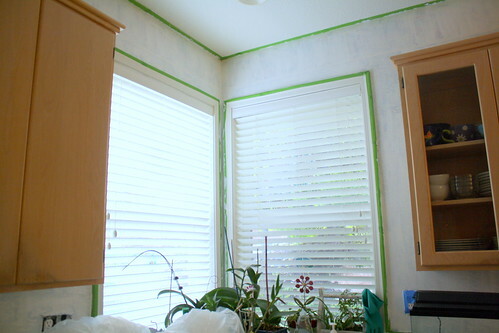 And when it was dry (I think the can recommended to wait two hours before painting), we just painted over the primer + wallpaper with Behr's Himalayan Mist from Home Depot. So here's the whole process in photos of the same area just with different angles. Again, I'm so sorry these photos are soooo terrible. 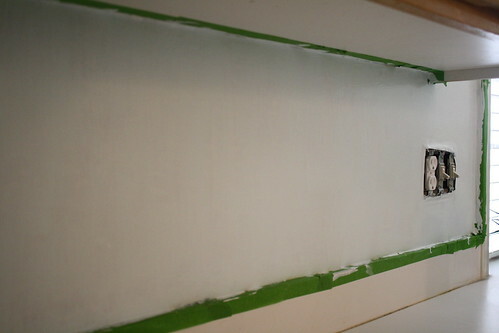 Okay, I realize that the color difference doesn't look drastic (between the primer and paint), but I think it looks WAY better than the wallpaper. 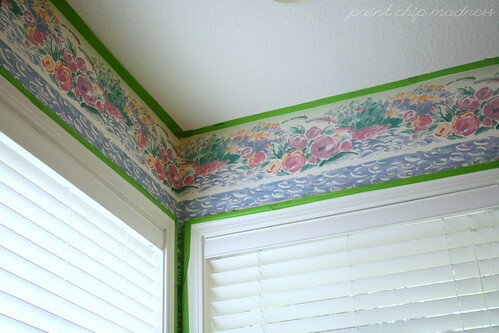 Have you ever used wallpaper primer? What about other DIY projects? 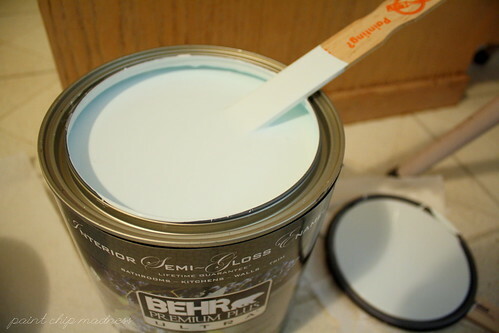 I like the Behr Himalayan mist color but, based on experience, don't plan to have wallpapered walls primed and painted over again. In our rush to move in, we let a painter go that route and experienced issues with bubbling, etc. 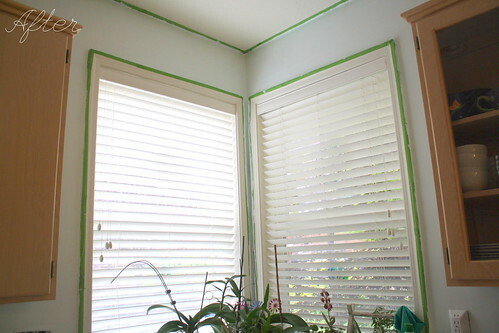 in one room when having it re-painted later. Perhaps it depends on products used. 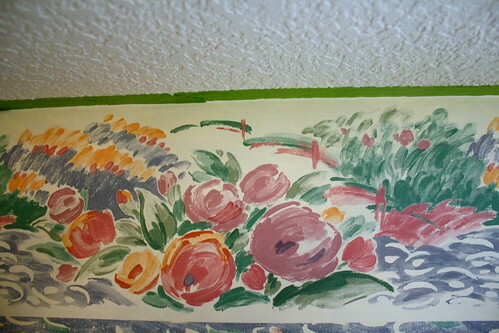 Now I take the time to use my trusty $50 steamer from Lowe's and a clean damp rag to remove wallpaper, glue, and now even the chalky, papery mess left from the primed/painted wallpaper job. That's just my two cents, and I have my fingers crossed for you.